Thanks to Bob Freedman, we were able to contact Dora Libson‘s son Aaron Libson in Philadelphia, and he told us the following about singer Dora Libson. Dora Libson was born in the village of Sasovo, in the Western Ukraine, officially in 1908, but he believes 1906 or 1907. She died in Philadelphia in 1985. Her father departed for America in 1913 and they were supposed to follow a year later, but the first World War broke out, and they only came to the US in 1924, after a year in Cuba. During those years they also lived in Mekarev (Yiddish name) and Kiev (the USSR). In Kiev at the Evreiski Bazaar (Jewish market), Dora heard many street singers and learned a number of songs and “kupletn” in a number of languages. Much of her repertoire is from her home in Sasovo. In Philadelphia she joined several choirs including the Freiheit Gesang Verein in the 1930s. When that choir was rejuvenated in the 1960s in Philadelphia her son Aaron also participated along with her. The family once had a recording of Dora singing songs in a number of languages – Russian, Spanish, Yiddish – but it was lost. The recording of Gabe! Vos vil der gabe? was recorded by Bob Freedman in the 1970s. Gabe! Vos vil der rebbe? (Gabe! What Does the Rebbe Want?) is one of those Yiddish songs that, it seems, was very popular but was almost never recorded. I could only find a version on the field recordings done by Joel Engel in the 1920s produced recently by the Vernadsky Library in Kiev. 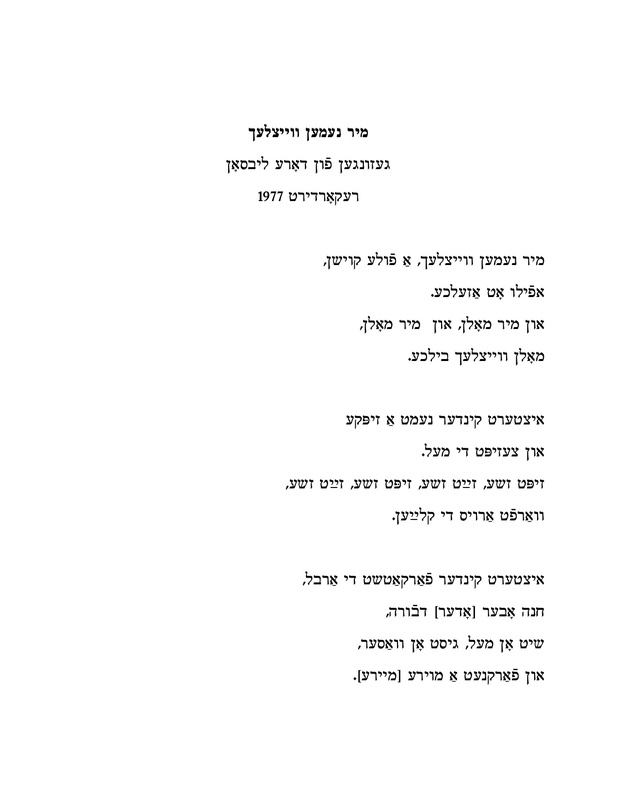 Menachem Kipnis‘s collection 80 folkslider, Warsaw, n.d. (you can find it on line at the National Yiddish Book Center‘s catalog) contains three similar songs: Lekoved dem Heylikn Bim Bom (page 63), Gabe, Vos vil der rebe? 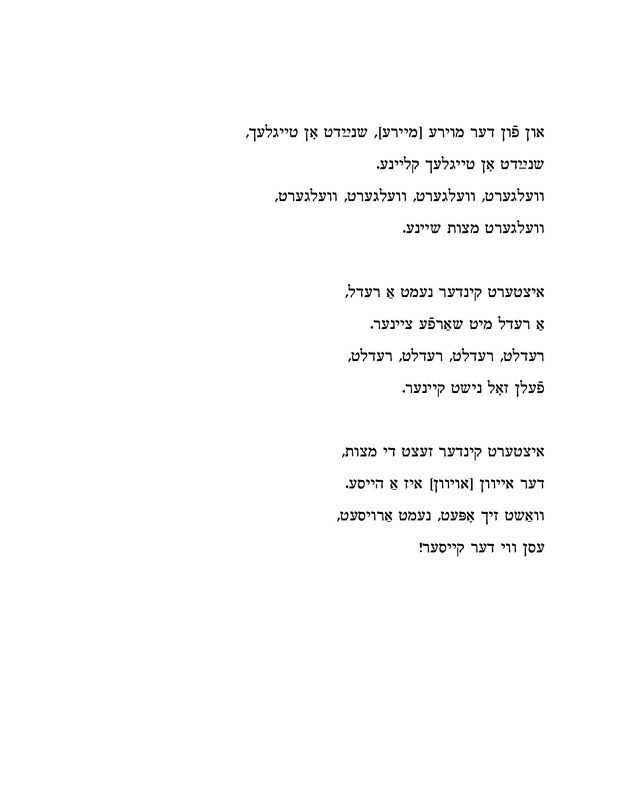 (page 65) and Lekoved dem heylikn shabes (page 67). Libson‘s version of the song pokes fun at the rebbe and his khasidim, but the Kipnis version of Gabe! (which is the closest to Libson‘s song) is a playful song but without the mockery. Just a change of a few words is all that‘s needed to turn a khasidic song into an anti-khasidic song. Der rebe vil me zol derlangen di fish. Tsu vos darf men di fish? Kedey di khsidimlekh zoln zikh zetsn tsum tish. What does the rebbe want? Der rebe wants us to give out the fish. Why do we need the fish? So that the Hasidim will sit down at the table. Der rebe vil, me zol derlangen di lokshn. Tsu vos darf men di lokshn? Keday di khsidimlekh zoln esn vi di poylishe oksn. The rebbe wants us to give out the noodles. Why do we need the noodles? So that the Hasidim will eat like Polish oxen. Der rebe vil, me zol derlangen dem kompot. Tsu vos darf men dem kompot? Kedey di khsidimlkeh zoln hobn klopot. The rebbe wants us to give out the fruit dessert. Why do we need the fruit dessert? So that the Hasidim will have something to do.